We love getting decked out for holidays, and now that it’s officially summer, all eyes are on July for those Independence Day celebrations. However, in the name of practicality, one thing we don’t love about holiday decor is how short-lived it can be. That Santa-patterned dish towel? A sad reminder come December 26th. The Jack-o-Lantern shaped pillow? Back in a box before Thanksgiving. 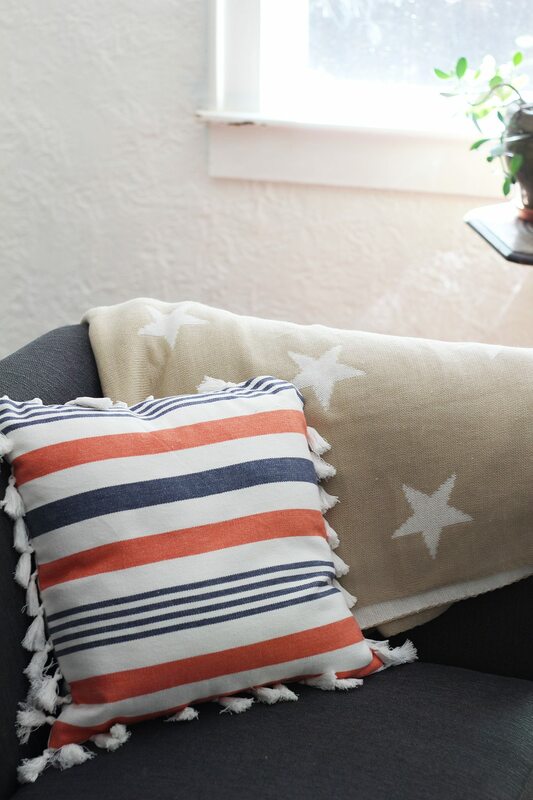 And perhaps nothing feels as July-centric as some star-spangled primary colors. Which is why, in the spirit of intentional, multi-use purchases, we stopped by Target for the best of their 4th of July decor. Below we’ve rounded up some, ahem, subtler options that simultaneously advertise your Americana spirit, without overriding your personal sense of style. ‘Tis always the time for twinkle bulbs, in our opinion, and we’re loving this updated set from Smith and Hawken. The metallic dip is touch of the unexpected, so you can keep them up (inside or out) all year ’round. Where else can you — should you — celebrate the 4th but outdoors? Try skipping a picnic blanket and opting for an outdoor rug instead. It’s a great way to cover an otherwise unsightly section of your backyard, plus it’ll be waterproof and a more durable way to create some additional space for firework watching. Add some outdoor pillows, this side garden table and some treats on an all-seasons wooden serving platter, and in addition to a party, you’ll have a new backyard hang space to last you all summer. If you want to add an extra touch of fancy, think about including these chambray placemats in the mix, was well. How great would they look at an outdoor picnic dinner, regardless of the month at hand? To the red, white and blue… and beyond. How are you planning to celebrate this 4th of July? The prints on the pillows and the bulbs are really great idea. Thanks for sharing this, if the print is different I think that we can use the decor also for autumn.